Enjoy the benefits of cooling or heating your home with reliable and energy efficient reverse cycle systems. Ducted reverse cycle air conditioning systems are versatile, providing heating when it’s cold while effectively cooling your home when it’s hot outside. As your family’s needs vary across the seasons, you need a machine you can trust right throughout the year. Ducted Reverse cycle air conditioning systems are incredibly efficient, cooling and heating more for less electricity. Today’s air conditioners are reliable and will provide many years of total comfort for you and your family. Ducted reverse cycle air conditioning systems absorb heat from the outdoor air to warm the air inside; a more energy efficient heating technique than other, conventional heaters which have to ‘create’ heat energy. LG - warm in winter, cool in summer. 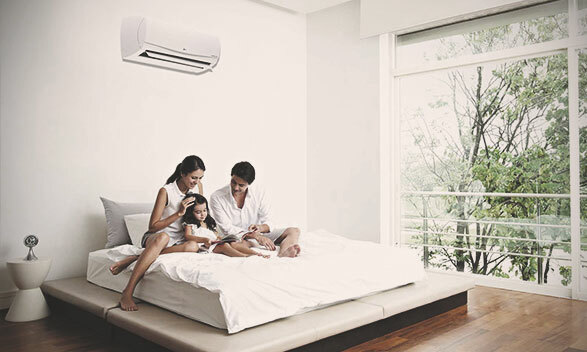 As well as providing smart air conditioning technologies, LG's Premium range of air conditioners help to create a purified home environment through air purifying technology. A series of air filters on the indoor units can remove airborne viruses, allergens, and even odours in addition to improved air quality. The LG indoor units can operate at low noise levels, creating a quieter environment.